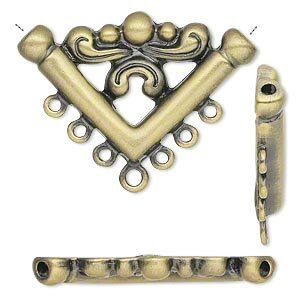 Connector, antiqued gold-plated "pewter" (zinc-based alloy), 26x14mm single-sided filigree V shape, 7 loops. Sold per pkg of 2. Item Number: H20-8579FX Have a question about this item? Designed using input from you, our customers, this antiqued gold-plated "pewter" (zinc-based alloy) multi-purpose finding can be strung, attached at any combination of the seven loops--or both. 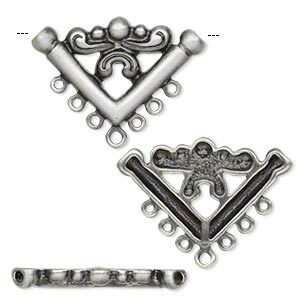 Formed in well-crafted molds, the "Corner Bead" casting yields a smooth surface, fine detailing and consistent size and shape. 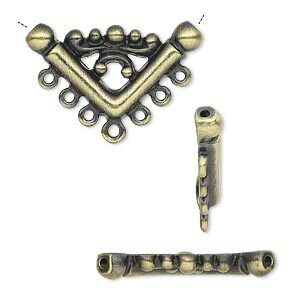 Connector, antiqued gold-plated "pewter" (zinc-based alloy), 35x22mm single-sided filigree V shape, 7 loops. Sold per pkg of 2. 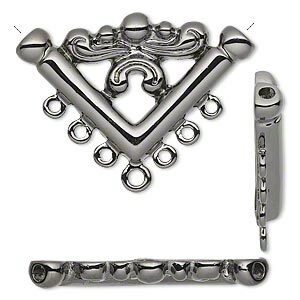 Connector, gunmetal-plated "pewter" (zinc-based alloy), 26x14mm filigree "V" with 7 loops. Sold per pkg of 2. 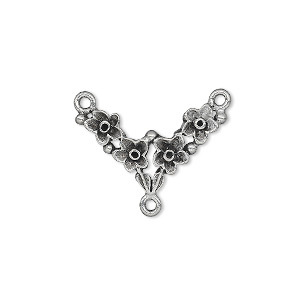 Connector, gunmetal-plated "pewter" (zinc-based alloy), 35x22mm filigree "V" with 7 loops. Sold per pkg of 2. 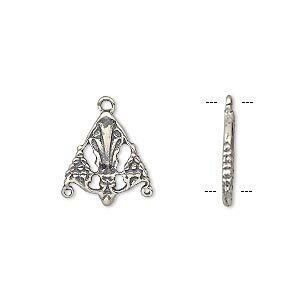 Connector, antiqued silver-plated "pewter" (zinc-based alloy), 35x22mm single-sided filigree V shape, 7 loops. Sold per pkg of 2. Connector, antique copper-plated "pewter" (zinc-based alloy), 35x22mm single-sided filigree V shape, 7 loops. Sold per pkg of 2. 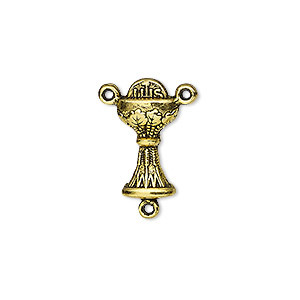 Connector, antique gold-finished "pewter" (zinc-based alloy), 19x10mm double-sided chalice Y-connector. Sold per pkg of 4. Connector, antique silver-plated "pewter" (zinc-based alloy), 19x10mm double-sided chalice Y-connector. Sold per pkg of 4. Connector, pewter (tin-based alloy), 22x12mm Y-shape with flowers. Sold per pkg of 4. 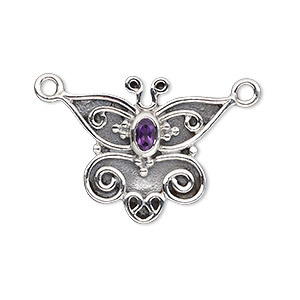 Connector, antiqued sterling silver and amethyst (natural), faceted oval, 26x22mm butterfly. Sold individually. Connector, sterling silver, 14x13mm Victorian Y-shape. Sold individually.